NIKA BOON is a London based Singer-Songwriter with a husky earthy vocal style often compared to Janis Joplin, PJ Harvey and Bjork combined. 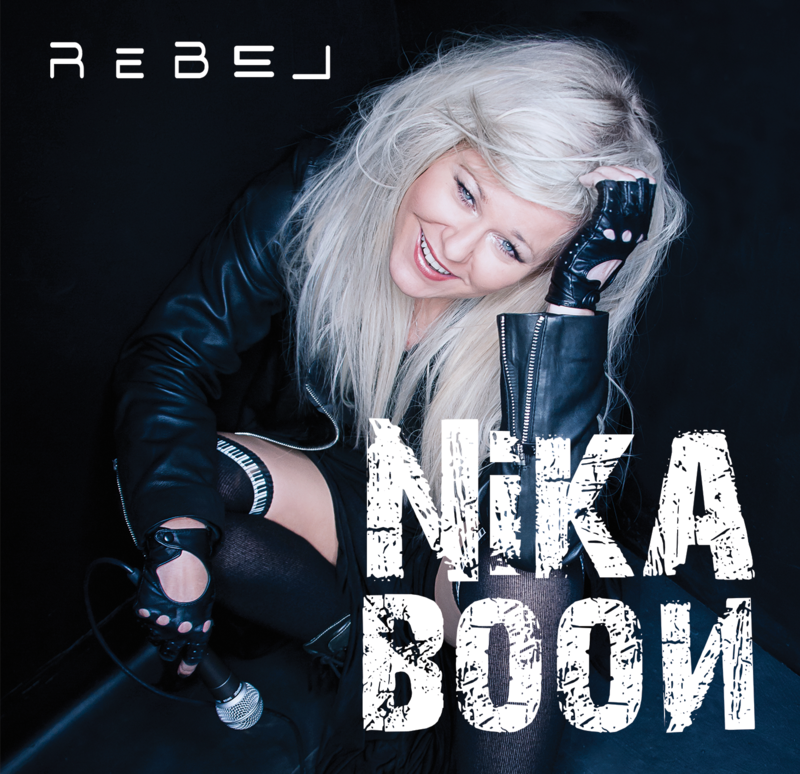 Now you can get her 3rd album Rebel recorded with the help from top musicians including: John Baggott on keyboards & moogs (Massive Attack, Portishead, Robert Plant from Led Zeppelin), Ian Matthews on drums (Kasabian), Carey Willets on bass (Athlete). She collaborated with an eclectic mix of artists over the years in a variety of styles including alternative rock, electro, chill-out and trip-hop. While each of her albums has a different flavour, the new one takes her back to her rock roots. Also Nika’s background in visual arts gives her a strong visual style and she gets heavily involved in her video production & stage presence. In the past Nika was signed to Roger Sanchez’s label Stealth Records. Her vocals have been used by numerous dance producers with the likes of Sandy Rivera, Dario G, Fingertapp, Eric Kupper and Solu Music. Nika has made guest appearances on Dj tracks from Kings of Tomorrow, G-Club, Timo Garcia and Cheshire Catz, amongst others. Her tracks can also be found on Defected Records and Berwick Street Records. Since her arrival in London she has been a lead vocalist in British bands like Blue Drag signed to Black on Black Records from Hoxton Square, or Talismantra managed by the Prodigy’s manager. Her first love is performing on stage, it’s where Nika truly comes to live, she feels at home in rock venues or dance clubs as well as on festivals during which she had a chance to perform all over the world. Rock is the style that inspired her to start making music. Now she’s come full circle and is making the defining album of her career, combining all of her vast musical experiences. Quotes about Nika: “She is really original! I love Nika’s voice and I intend to work with her again!” – Roger Sanchez. “Nika’s song-writing brings a distinctive, sharp and personal feel to music. Her melodic voice creates the whole atmosphere of the track” – G-Club. Do grona muzyków współpracujących z Niką Boon na najnowszej płycie “Rebel” należą John Baggott (Massive Attack, Portishead, Robert Plant), Ian Matthews (Kasabian) and Carey Willetts (Athlete). Nika Boon wywodzi się ze sceny alternative rock/grunge, po wygraniu premierowego programu Szansy na Sukces otrzymała oferte współpracy z angielską wytwórnią płytową i od lat 90’ Nika zamieszkuje w Londynie. Na początku swojego pobytu w Wielkiej Brytanii pisała i wykonywała muzykę z zespołem Talismantra, prowadzeni przez managera Prodigy występowali na największych światowych scenach festiwalowych. W roku 2002 nowojorski DJ Roger Sanchez podpisał Nikę do swojej wytwórni Stealth Records zaczynając współpracę od singla “Alone”, w tym czasie kolaborowała też muzycznie z dj-ami takimi jak: Timo Garcia (Berwick Street Records), Sandy Rivera (Kings of Tomorrow), G-Club, Fingertapp, Eric Kupper, Dario G, Cheshire Catz, oraz Tall Paul. Kolejne albumy Niki “Troublemaker” i “Faces” wydane są w londyńskiej wytwórni Effectiva. W ostatnich latach Nika powróciła do swoich korzeni rockowych czego dowodem jest jej najnowsza solowa płyta “Rebel” wydana w 2017 również po polsku przez Polskie Radio. W 2018 roku z Niką Boon będzie współpracował legendarny gitarzysta i poroducent muzyczny Nile Rodgers (Daft Punk, David Bowie, Duran Duran, Madonna).